When one thinks about Audrey Hepburn, one can instantly picturise a petit looking lady with hair tied neatly in a bun, wearing minimum make-up but exuding maximum elegance; dressed in classic pearls and a little black dress; gazing absorbedly at the camera. Hepburn was the classic fashionista right from the beginning, but as life would have it, she hit upon a rough patch when she was very young. When she was just six years old, little Audrey witnessed the divorce of her Anglo Irish father and Dutch mother, and was overcast by the trauma of her father leaving the family. Shortly after the incident, World War II broke out in Germany, and the family moved from their home in Belgium to Holland, which was thought of as a safer bet. However, Holland was invaded by the Nazis soon after, and this drove the family into depths of poverty – all their rations were minimised, and all their material assets were seized. 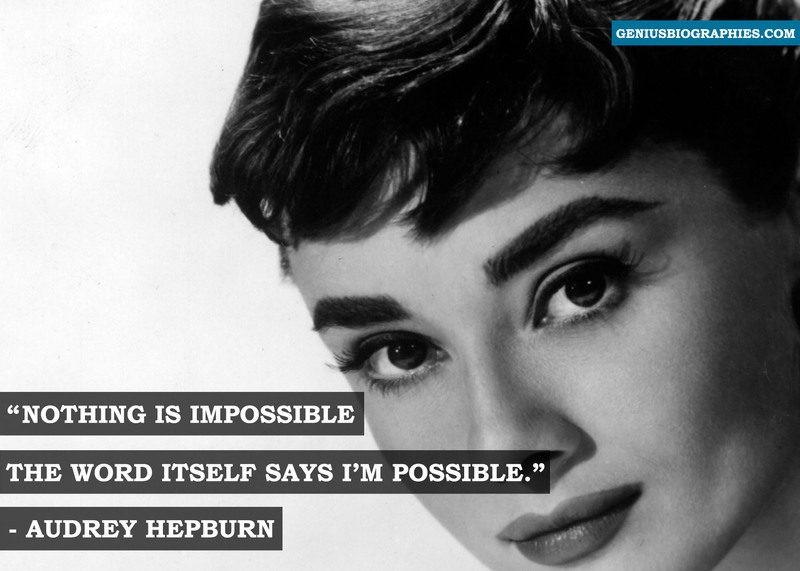 Many of Hepburn’s relatives were killed on the streets, and this left her mother and her to fend for themselves. Hepburn was a young girl at this time, and this took a toll on her health so severe that she developed malnutrition and many other health problems. On some days, she ate only flour and tulip bulbs to get through to the next day. There was one passion that kept her going through the severity of war – and that was her love for ballet. She dreamt of becoming a professional ballet dancer one day. Hepburn started taking ballet lessons at the Arhnem School of Music, and soon became an ace student. To show her support for the Dutch, teenager Hepburn would perform ballet behind closed doors to raise funds for the resistance. She also taught ballet to young girls, to provide a bit for her family. Hepburn’s frail condition did not deter her from donning the breadwinner’s robes for her family and participating in a noble cause, risking all that she had. It was her bold, yet caring nature that shaped her personality and made her resist failures that came her way. Consequently, when Holland was liberated, Hepburn shifted with her family to England, where she began modelling and was soon picked to star in her first movie. Tough times call for prompt action. It is the fire within that makes you get ahead of the rough patches in life, and excel. Passion overshadows all difficulties. Always find a way to fuel what you love to do. There is no better formula for success.